If it is time to upgrade your lifestyle and find a beautiful place to reside, The Melrose Apartments are just what you're looking for. 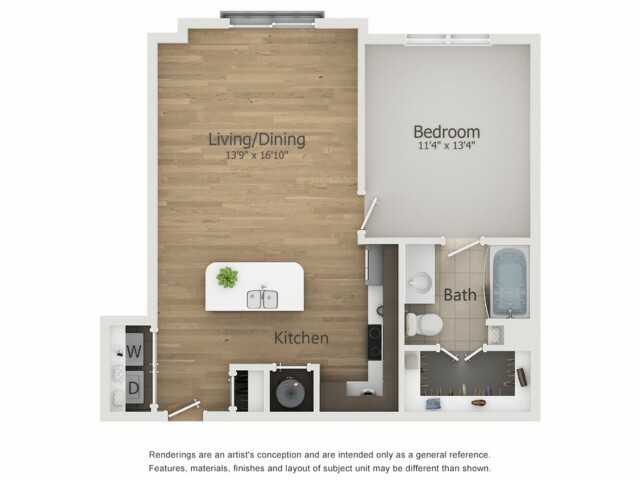 The A4 flat is 721 square feet of luxury living space, boasting an open-floor plan concept. Your kitchen has hardwood style floors, a center island with granite countertops and solid wood cabinetry. The stainless-steel appliance package is energy efficient, as is the upgraded lighting and washer/dryer unit. Your bathroom has ample storage with walk-in closets and a garden tub to add to the well-appointed style. You will have room for 2 furry companions, as The Melrose Apartments are a pet-loving community and have a Bark Park for your convenience. Your new local living community provides you with several on-site amenities to add to your upgraded lifestyle. After a long day there is no better way to relax then lounging on the sundeck by the saltwater pool or grilling dinner in the outdoor kitchen. If you are entertaining, take advantage of the clubhouse, demonstration kitchen, movie lounge or music performance space. If you enjoy a more active lifestyle, make sure you take advantage of the 24-hour fitness center, with fitness concierge and 3 times weekly City Fit classes. The Melrose Apartments have a 24-hour business center, coffee and tea bar for those late nights and emergency maintenance for any issues that may come up. Safety need be of no concern, as you have private parking within our gated community. Located in the vibrant neighborhood of Melrose, these apartments are part of a historic 1940’s renovated movie theater complex. There are several local eateries on-property like Sinema, The Sutler Moon and Fenwick’s 300 for a close but fun evening out. You are also just steps away from shops, more dining and local grocery stores. With our convenient location to the 440 Parkway and I-85, you are just a short drive from the rest of Nashville. The Melrose Apartments are less than 3 miles from Vanderbilt University, making them a perfect fit for students, staff or Commodores fans. You may apply for the A4, one-bedroom apartment, pay rent and request maintenance all in one place at The Melrose Apartments. Give us a call today at (615) 696-7448 to schedule a walk through.